The ink and toner cartridge remanufacturing industry has reached an inflection point. Established in the United States in the 1980s, the remanufacturing industry quickly became a global enterprise and remanufacturers have refurbished billions of cartridges over the past thirty-plus years. Although the industry is well-established and remanufacturers continue to generate billions of dollars in sales each year, remanufacturers are finding it increasingly difficult to thrive and grow as they cope with 21st-century market demands, especially relentless pressures from newly built compatible cartridges, which are often marketed without regard for intellectual property (IP). 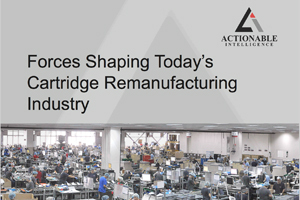 In “Forces Shaping Today’s Cartridge Remanufacturing Industry,” Actionable Intelligence, the world’s leading research firm following the markets for printers and copiers and the supplies used in these machines, explores the current state of the remanufacturing industry. 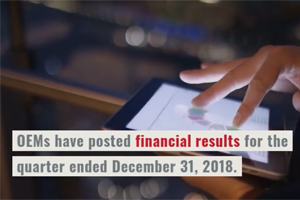 The 39-page report analyzes the regional remanufacturing industries supplying some of the world’s largest cartridge markets including China, Europe, and North America. 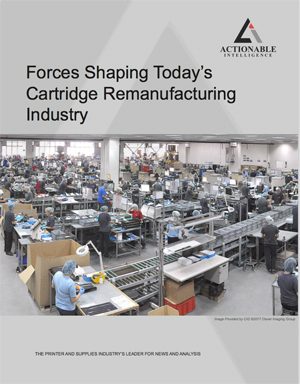 Focusing on remanufacturers in China, Europe, and the United States, “Forces Shaping Today’s Cartridge Remanufacturing Industry” examines where the industry is today; how it got there; and what the future holds for remanufacturers worldwide. The report maps the current competitive landscape and differentiates between the various categories of cartridges vying for market share. In particular, the report analyzes the impact that IP-infringing cartridges (a.k.a. “clones”) have had on the remanufacturing industry. “Forces Shaping Today’s Cartridge Remanufacturing Industry” is a must-read report for anyone involved in the digital imaging consumables market.